All our beef is Grass Fed beef! We offer both Grass fed beef that has been Grain Finished and beef that has only been fed grass or forages the last 12+ months. Our grass fed beef is very lean, has minimal marbling/fat, and tastes more like wild game. It is more comparable to elk or buffalo than beef. Shares of beef are only available in the fall and there is limited availability of retail cuts. All of our beef is Grass fed- this beef had had grain added to the diet the last few months for great marbling, flavor, and tenderness! 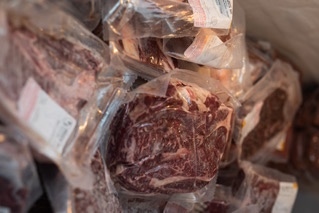 Stock your freezer full of the “good stuff” and wow company with affordable beef anytime they visit. All of our beef is Grass fed- this beef had had grain added to the diet the last few months for great marbling, flavor, and tenderness! Just want the perfect steak or burger to grill this weekend, we have you covered. All available cuts are available for online pre-order for pickup at the farm store of just make an appointment to stop by. You can find us all summer long at local farmers markets as well!